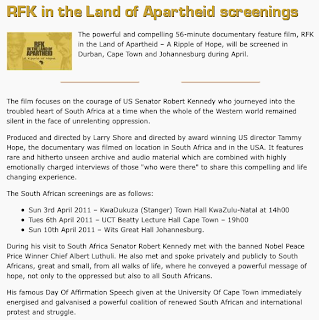 The powerful and compelling 56-minute documentary feature film, RFK in the Land of Apartheid – A Ripple of Hope, will be screened in Durban, Cape Town and Johannesburg during April. The film focuses on the courage of US Senator Robert Kennedy who journeyed into the troubled heart of South Africa at a time when the whole of the Western world remained silent in the face of unrelenting oppression. Produced and directed by Larry Shore and directed by award winning US director Tammy Hope, the documentary was filmed on location in South Africa and in the USA. It features rare and hitherto unseen archive and audio material which are combined with highly emotionally charged interviews of those "who were there" to share this compelling and life changing experience. * Sun 10th April 2011 – Wits Great Hall Johannesburg.